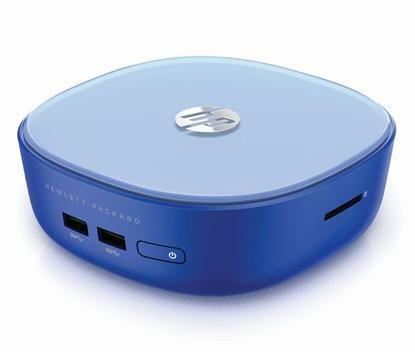 Hewlett-Packard is making an assault on low-cost Chrome desktops with an inexpensive Stream mini-PC running Windows 8.1. The Stream Mini Desktop starts at US$179.99, and has similarly minimalist features to low-cost Chrome desktops, or Chromeboxes. The cheapest Stream model has just 32GB of internal storage and 2GB of RAM, and like Chromeboxes is for those who do most of their computing online. The compact desktop weighs just 648 grams. It has a low-end dual-core Intel Celeron processor and Windows 8.1, which Microsoft provides at no cost to PC makers to encourage its spread on the low end. HP also sells low-cost Stream laptops with Windows 8.1. The Stream desktop is one of HP's cheapest, and brings Windows to consumers at an affordable price. The desktop has an advantage over comparable Chrome PCs as it can run more applications without an Internet connection. Most applications in Chrome PCs require an Internet connection, though the catalog of offline applications is growing. Microsoft wants to keep potential buyers away from Google's Chrome OS, and the Windows-Chrome desktop clash mirrors a battle already being waged in laptops. Chromebooks have surged in popularity as a viable low-cost alternative to Windows laptops, especially among those disillusioned with Windows 8 and those who do most of their computing in the cloud. An Asus Chromebox is sold in Best Buy for $169. HP and Dell both sell Chromeboxes for $179. HP's Stream desktop offers a bit more flexibility than Chromeboxes. Multiple monitors can be attached to the HDMI and DisplayPort ports, though the PC itself has limited graphics capabilities. Stream also has four USB 3.0 ports, so it is possible to attach an external hard drive to increase storage beyond the limited 32GB inside the PC. Windows has better plug-and-play features than Chrome OS, and will recognize a wider range of external storage drives. While Chrome OS is lean, Windows 8.1 occupies a lot of internal storage, so users may eventually need external storage. Microsoft is bundling two free years of 200GB storage on its OneDrive hosting service with the desktop. The Windows PC comes with one occupied SO-DIMM memory slot, but an additional slot is available to upgrade memory capacity. The desktop also has Bluetooth and Wi-Fi connectivity. Comparing the Stream laptop and desktop, each has its own advantages. The Stream laptop is portable, and has the keyboard and display. But the expansion capabilities in the Stream desktop make it a good option if you already have a keyboard and an external display. If you're looking for a more powerful mini-desktop, consider HP's Pavilion Mini Desktop, which will ship this month starting at $319.99. A base configuration includes a dual-core Intel Pentium processor, 4GB of RAM and 500TB hard drive. For a higher price, the desktop can be configured to include a Core i3 processor, up to 1TB of hard-drive storage and 8GB of memory. Other features on the Pavilion Mini Desktop include four USB 3.0 ports, Wi-Fi and Bluetooth 4.0. It also has HDMI and DisplayPort ports to connect the PC to external monitors. Both the Stream and Pavilion desktops also have Ethernet ports.